Have you ever heard someone joke that if they knew they'd have lived so long, they would have taken better care of themselves? As it turns out, this is no joke. Today's retirees tell us in no uncertain terms that the number-one ingredient for a happy retirement is, by no small margin, having your health. Sure, other things are important, like being financially secure and having a loving family and friends, but a new study reveals that health trumps all as the key factor to having a happy and satisfying retirement. My firm, Age Wave, in partnership with Merrill Lynch, just completed a comprehensive new study titled Health and Retirement: Planning for the Great Unknown. We surveyed 3,300 pre-retirees and retirees nationwide--from all walks of life and socioeconomic strata--to uncover their concerns and worries about health and health care expenses in retirement. The study also revealed which steps you can take right now to make your retirement healthier and happier, with more financial security and greater peace of mind. This article is the first of a two-part series that will explore some key findings from the full study report. This year, the youngest of the boomer generation are celebrating their 50th birthday, while the oldest, at age 68, are moving into what has traditionally been defined as the retirement years. When it comes to their health, the boomer generation, as a whole, has consistently been more proactive and demanding than their parents. Back in the 60s, boomers created the Boston Women's Health Collective and wrote Our Bodies, Ourselves, an ode to self-responsibility in health. And that was just the start. During every stage of life, boomers have adopted a more holistic and empowered approach to health. For example, they catalyzed the fitness movement: in the 1960s, less than a quarter of adults exercised. By the 1980s, six in ten exercised regularly. By their early 30s, half of all boomers had used alternative/complementary medicine, such as acupuncture, chiropractic medicine, or herbal supplements. Fast forward to today and boomers are 30% more likely to use alternative/complementary medicine than the Silent Generation preceding them. Boomers are also far more demanding in their relationship with health care professionals. For instance, they want their doctors to pay attention to their minds as well as their bodies. The overwhelming majority (95%) say it's reasonable to expect their doctors to ask them about their fears and concerns (only 10% of doctors agree). As one focus group participant told us, "My doctor needs to understand my health worries--what keeps me up at night--just as well as she understands the results of my blood tests. They are both important to me and both impact my overall well-being." The way boomers relate to their doctors is worlds apart from that of their parents. Another focus group participant explained it this way: "My parents believed that a doctor's word was gospel. You didn't question it. Today, you need to be your own health advocate." 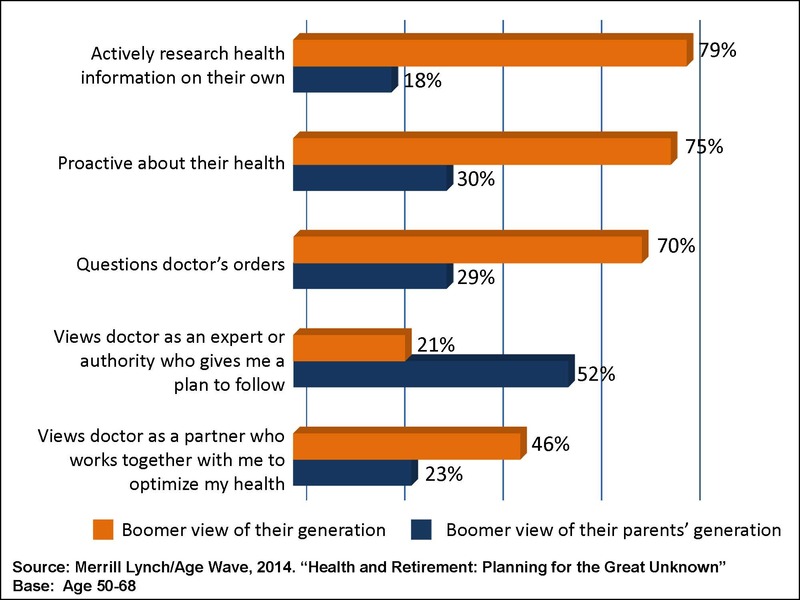 Indeed, 70% of boomers say they regularly question doctor's orders, but only 29% say that their parents did the same. Most retirement planning focuses on savings, pensions, 401(k)s, and great post-work places to travel or live. However, people age 50+ identify health care costs as their biggest financial worry in retirement. 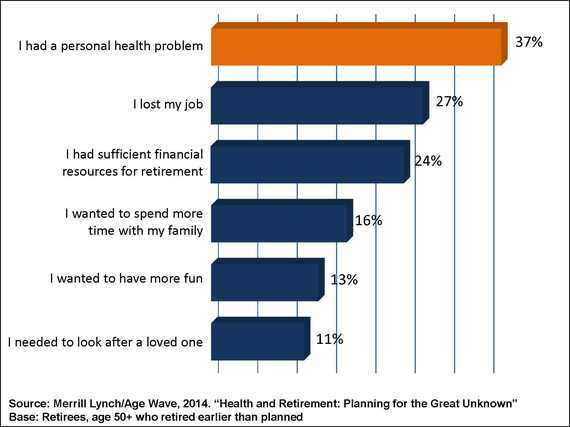 This is where the issues of health and wealth converge in retirement (see figure 3), which is why it's wise for your retirement planning to include health and health costs as key ingredients. Of course, planning for health costs can be hard, since so much is unknown about your future health status. When we probed this issue in focus groups, people expressed sentiments such as, "It's the uncertainty," "How can you plan for health care when you don't know what will happen down the road?" and "There are so many unknowns." 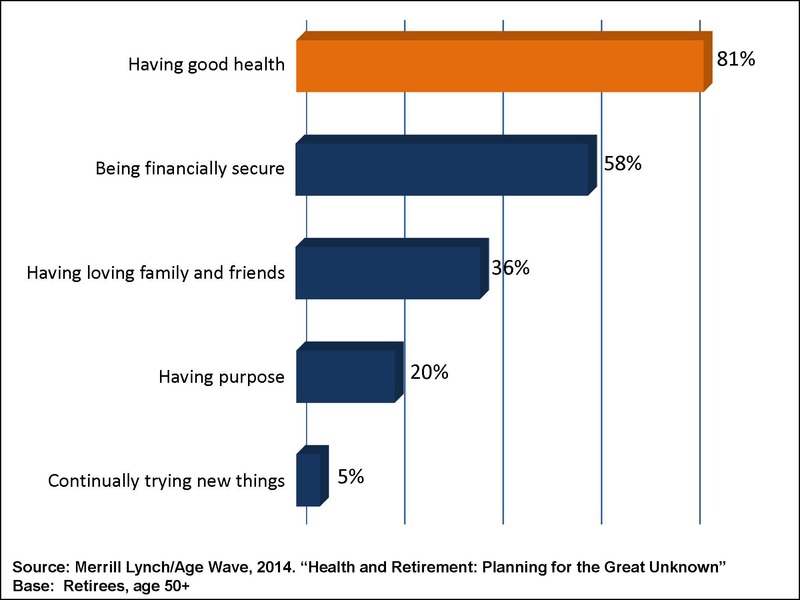 Health challenges can present a double threat to your retirement financial security. First, health insurance and out-of-pocket health care expenses can be unpredictable and costly, potentially shrinking retirement savings, and today's pre-retirees and retirees can count on less help from employers when facing health care costs. (Twenty-five years ago, two-thirds of large companies offered health benefits to retirees; now, just one-third of these companies offer retirement health benefits.) Second, unexpected work leaves or early retirement due to health problems can reduce earning years and retirement savings potential; retirees say health problems are now the top reason for early retirement (see figure 4). Clearly, planning effectively for health and health care expenses is the missing link in holistic retirement planning. Yet most people feel that the information they receive from the government and/or insurers can be overwhelming and confusing. A mere 7% of people age 55-64 say they feel very knowledgeable about Medicare coverage options. And among actual Medicare recipients, only 19% say they feel very knowledgeable about Medicare. As Andy Sieg, Head of Global Wealth & Retirement Solutions for Bank of America Merrill Lynch observes, "This research provides an important wake-up call for everyone involved in helping people plan for this next stage in their lives. Respondents are telling us that this is not a do-it-yourself project. They are seeking clear information and trusted resources to help them figure out how to plan for health care costs in retirement." Invest in your health by maintaining healthy lifestyle habits and strong social connections. Even when started later in life, these can both significantly improve well-being and vitality during your retirement years. Educate yourself about Medicare, including new preventative care and recent eligibility changes for therapy and home care. While you're at it, estimate out-of-pocket health care expenses such as insurance copays and Medicare premiums. Create contingency plans for unexpected health problems and health care expenses for yourself, your spouse, and even other family members. This might feel challenging, but doing so can ultimately give you greater peace of mind. Boomers have a take-charge attitude toward their health and health care, so this list can serve as a guide for that proactive management of lifelong health and the associated costs. These practical steps can help protect your health and wealth in retirement. Stay tuned for part two of this series, posting tomorrow. I'll describe the four different HealthStyles of boomers and discuss what makes each one tick.